The menu holds all the different blocks and buttons to get you on your way to making a level. All the buttons for loading, saving, and publishing are on top. The different blocks are in the middle, and the color selector at the bottom. Use this to select different colors for you blocks. It is necessary to use this for some blocks. Wheel - The wheel is what the player controls with the arrow keys. You need to place one of these in order to publish your level. Plain Block - The plain block is just your regular block that can be jumped on or rolled over. Color Lock - The color lock block, blocks all colors that are not corresponding with it. If the wheel is the same color as it, it is able to pass through. 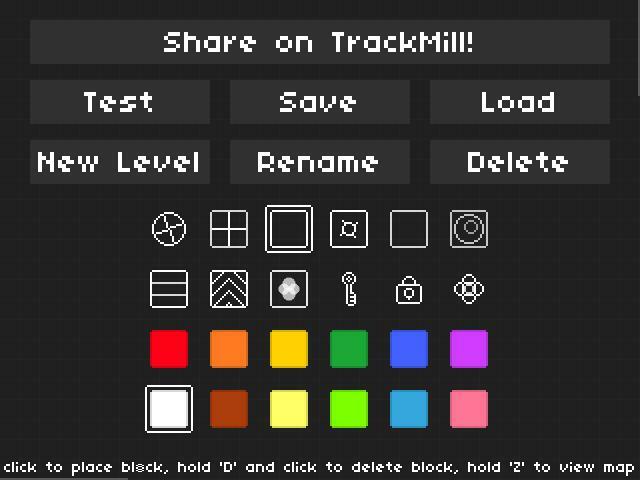 Color Switch - This block with convert the wheel to whatever color the block is. If the wheel goes into a red color switch as white, it will come out red. Invisible Block - This block remains invisible, until you get close. It then appears for you to use it. Oh, and the middle eye follows you creepily. Breakable Block - If you jump or roll over this block, it will melt away like sand. Be careful! Boost - When you jump off of this block you get shot up with great speed. Great for getting to those high places! Portal - The portal blocks are great for tricking up the player. You can only place two per color (Entry and Exit). Speedy thing goes in, speedy thing comes out. Key - Collect these around the level to unlock the locks. You can place multiples. Lock - Good for blocking off certain areas from the player. Unlock via key of corresponding color. Spike - This is the only hazard in the game. If you let your wheel touch this you will need to restart the level.